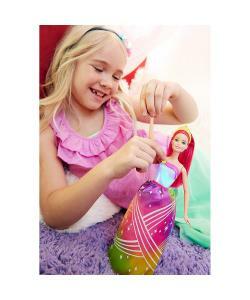 Tell all sorts of Dreamtopia fairy tales with this gorgeous rainbow princess doll ready to brighten anyone's day with a fabulous rainbow light and sound show. Start the magic to play out a story, amaze an audience or add a rainbow of colour to your world. 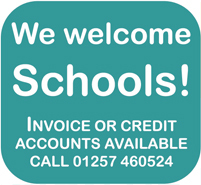 Includes Barbie Dreamtopia Rainbow Cove Light Show princess doll with light show and sound effects wearing a removable skirt, shoes and tiara. 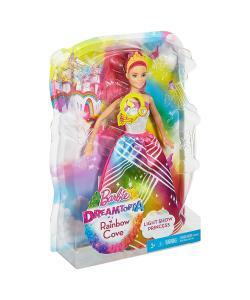 Lights and sounds bring this magical Barbie Rainbow Cove Light Show Princess doll from Dreamtopia to life! The "gem" on Barbie rainbow princess doll's bodice starts the light and sound shows. Experience the fun of Dreamtopia by pushing the "gem" to activate seven different light and sound sequences for a spectacular wow moment! It's a magical Rainbow Cove effect you'll want to enjoy over and over again. 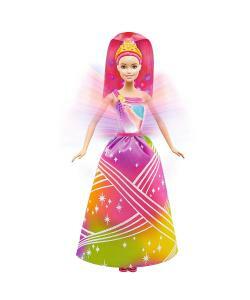 Watch as colourful rainbow shows light up Barbie princess doll's dress and long, brightly coloured ponytail. A translucent bodice with a colourfully striped neck and shoulder detail makes a perfect backdrop for the rainbow light show. And when the lights project on her vibrant pink hair, Barbie doll looks spectacular. She's ready for princess fun in Rainbow Cove wearing her bright orange tiara and a long rainbow skirt decorated with shimmery hues and sparkling stripes and stars. Pink shoes complete the royal look. Doll cannot stand alone.